The Zionist Organization of America (ZOA) strongly disagrees with the Anti-Defamation League (ADL) CEO Jonathan Greenblatt’s praise for Israel-hating antisemitic Congresswoman Ilhan Omar (D-MN) and ADL/Greenblatt’s acceptance of Ilhan Omar’s limited phony “apology.” Rep. Ilhan Omar’s “apology” was a belated, limited “non-apology” for one tiny part of Omar’s numerous vicious, Israel-hating, antisemitic, compassion-for-Israel-hating-ISIS-convicts statements and positions. And egregiously, Ilhan Omar again falsely attacked Israel in the very same breath along with her phony, non-substantive “non-apology.” llhan Omar also never apologized for falsely calling Israel “evil” and an “apartheid regime,” and for continuing to promote anti-Israel boycotts, divestment and sanctions (BDS) – and for lying to voters by making them falsely believe that she opposed BDS while she was running for Congress. Additionally, Rep. Omar has never apologized for seeking reduced sentences for, and expressing “compassion” for anti-American, anti-Israel, murders and rapists ISIS recruits. Clearly, Rep. Omar lacks credibility and her weak words of “apology” can’t be taken seriously. Ilhan Omar never apologized for calling Israel “evil” and an “apartheid regime,” supporting BDS and for seeking reduced sentences for & expressing “compassion” for ISIS recruits. ZOA believes that it is a serious mistake for ADL/Greenblatt to accept Rep. Omar’s limited “apology” and for ADL/Greenblatt to actually praise Ilhan Omar – while Omar is continuing to spew antisemitic anti-Israel hatred and promote economic warfare against the Jewish people. ADL’s praise for Rep. Omar may well embolden Omar to continue her antisemitic anti-Israel vendetta. Omar has never apologized for falsely calling Israel an “apartheid” state! Notice also how Omar used the word “regime” when referring to Israel. The term “regime” is generally reserved for fascist dictatorships and totalitarian governments. Antisemitic Israel haters commonly demean Israel by using terms such as “Zionist regime” and “Israeli regime” when referring to Israel. Omar has also never apologized for insultingly calling Israel a “regime”! Omar also never apologized for lying to her constituents and supporting the antisemitic BDS campaign. Moreover, if Rep. Omar lied then, why should anyone believe her weak, limited apology now? ADL’s mystifying praise for Rep. Omar whitewashes her antisemitic Israel-hating record and may embolden her to continue her ugly vendetta. So Rep. Omar, as part of her phony alleged apology, falsely condemned the Jewish State for committing “injustice” and “oppression” and “attacking our values as humans” – and insisted that we must “stand up” to Israel! Some apology! 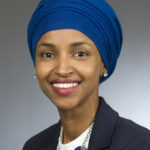 In accompanying tweets, Rep. Omar also attempted to justify accusing Israel of “evil doings” by absurdly saying: “the acts of war justified or not will always be acts of evil to me.” Ilhan Omar thus also revealed her immoral inability to distinguish Hamas’ terrorist onslaughts from Israel’s efforts to stop Hamas from deliberately murdering innocent Jewish civilians. And she absurdly actually says that “justified acts of war” are “evil!” Does Ilhan Omar also believe that World War II fighting to stop the Nazi horrors was evil? Moreover, if Omar really believes all acts of war are evil, why has she hypocritically never condemned Hamas’ and Fatah’s evil acts of war against innocent Israelis or Iran’s threats of war against Israel and the USA? Omar also claimed that she was being “smeared” – when people are only repeating her own words. 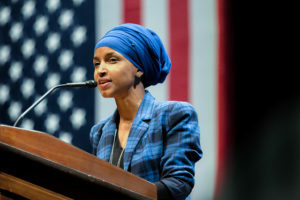 The ZOA strongly disagrees with Mr. Greenblatt’s unwarranted effusive praise for Rep. Omar’s limited phony apology for just one part of her many hateful statements attacking the Jewish State. The ADL/Greenblatt response gives Ilhan Omar the appearance of a clean slate, and risks whitewashing her numerous, never-apologized-for Israel-hating statements and positions. 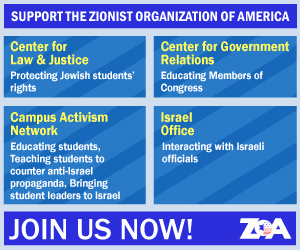 ZOA National President Morton A. Klein stated: “ZOA strongly disagrees with the ADL CEO Jonathan Greenblatt accepting Rep. Omar’s phony apology for one part of a statement she made, while ignoring all the other Israel-hating statements. ZOA moreover strongly disagrees with ADL/Greenblatt’s unwarranted praise to Rep. Ilhan Omar. “We at ZOA want to clearly state that ZOA does not accept Ilan Omar’s so-called ‘apology’. “The ZOA believes that when people accuse the Jewish collective of indulging in evil and hypnotizing the world, they do so knowingly and intentionally. Such people know perfectly well what they are saying. Someone making such statements reveals an extraordinary, powerfully-ingrained hatred for the Jewish State of Israel and Jews. “In light of all this, we are mystified as to why ADL’s Jonathan Greenblatt gave aid and comfort to Rep. Omar’s hateful antisemitism by accepting her limited non-apology as “honest”, “respectful” and “open” and praiseworthy. Do ADL and Greenblatt really believe Omar now clearly has, as Greenblatt wrote, “a commitment to a more just world,” when Omar continues to promote anti-Israel BDS and hatred towards Israel and supports compassion for and reduced prison sentences for the Jew-hating, America-hating demonic killers and rapists of ISIS? !